This page contains quotations from a booklet published in 1984 and written by Colonel Bob Hume, based on articles in the 1980 and 1981 R.E.M.E. Journals. The material is Crown Copyright, and is reproduced by permission of the R.E.M.E. Museum. 'The Remount Department was a slender organisation. Purchasing was the responsibility of two Assistant-Inspectors of Remounts; a third controlled the Registration Scheme. There were two remount depots: the old Remount Establishment at Woolwich and a second in Dublin. Woolwich retained its affiliation with the artillery and engineers and the depot in Dublin provided a centre for purchasing activities in Ireland, where most cavalry remounts were obtained. The depots received newly-purchased animals and held them until they were seen to be fit for issue to a unit. Remounts were not trained at the depots. Most had been broken-in before they were purchased and the further schooling that they needed in ceremonial and tactical work was given after they had joined their regiments. 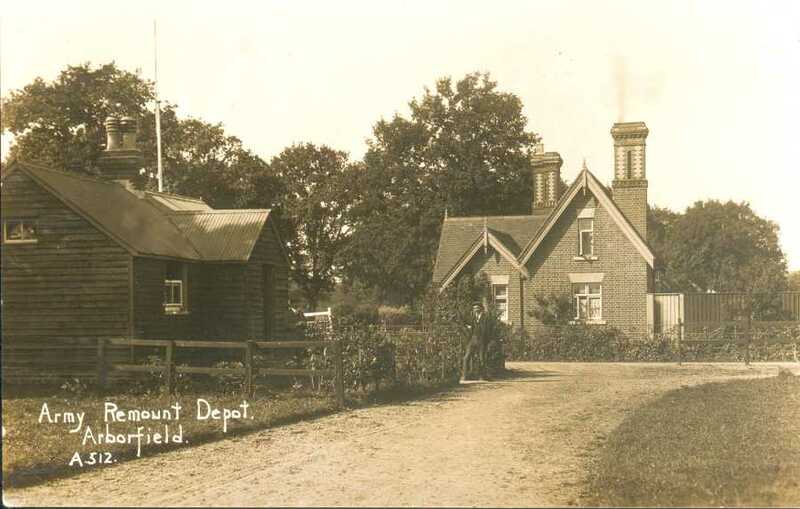 'The parcel of land originally acquired for the Arborfield Remount Depot was part of the Bearwood Estate owned by the Walter family. It was an area of some 200 acres enclosed by Langley Common Road, by the line of the old Reading Road (now marked by Bramshill Close, Whitehall Drive and Sheerlands Road), by the tree-lined track which still marks the southern boundary of the Garrison and by the limit of the rising ground to the east of Biggs Lane. In later years the eastern boundary was marked by a strip plantation of fir trees, which offered horses at grass some protection from the extremes of weather. Only a vestige of this plantation now remains: the Sandhurst-style barracks have taken its place. 'At the time of its acquisition by the War Office in March 1904 the land was worked by three farms: Biggs's Farm, Old Biggs's Farm, from which Biggs Lane derives its name, and Ellis's Farm. All three have since been demolished. Biggs's Farm, the largest of the three, stood where Headquarters Arborfield Garrison has since been built. Old Biggs's Farm was within the moat, close to the line of Princess Marina Drive. Its foundations were exposed during reconstruction work in 1979. Ellis's Farm lay to the east of Biggs Lane; the site is now bordered by the Garrison lake. Since the whole of the land was devoted to agriculture it offered all the facilities needed by a remount depot: pasture for grazing, land under the plough to raise forage and outbuildings for stabling. The stables could accommodate around 150 horses but more could be run at grass since, unlike the Garrison today, the remount Depot was largely open grassland, with few trees and buildings. ... 'The veterinary officer was assisted in his duties by the farrier-major of the depot: Farrier Quarter-Master Serjeant Clark of the 6th Dragoon Guards (The Carabiniers). When he left the Service some years later, William Clark took the licence of 'The Swan' in Arborfield Cross. 'The quartermaster, veterinary officer and farrier-major were apparently the only serving soldiers at the depot. The rest of the staff, probably no more than fifty in all, were civilians. The quartermaster and farrier-major lived within the Depot: the quartermaster in Old Biggs's Farm and the farrier-major in White C ottage, a small thatched house which stood on the southern boundary of the Depot. In 1906, Moat House was built as a residence for the officer in command and at some later date Old Biggs's Farm was demolished. 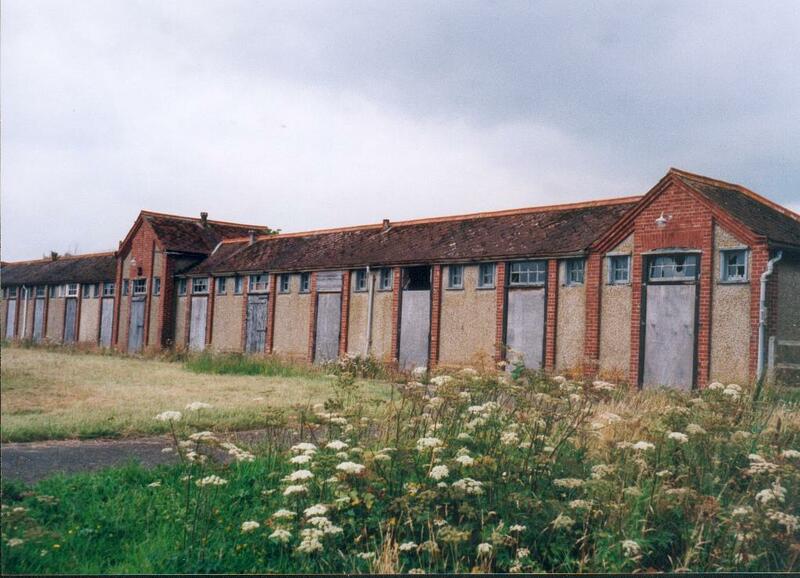 Ellis's Farm and Biggs's Farm provided further accommodation which wa s presumably used by some of the civilian staff. 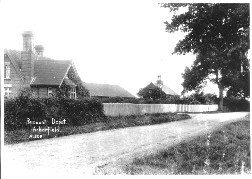 The veterinary officer and the inspector of remounts lived out of the Depot, the veterinary officer at 'Birch House' in Arborfield Cross and the inspector at 'Four Firs' on the Shinfield Road. Both these properties still stand'. '[...] During the course of the war, almost 600,000 animals and as many again were imported into England from overseas. In addition, the Remount Commissions shipped a substantial number of animals direct to the various theatres of war. 'Much valuable background information on the Army Remount Service was generously provided by Mr. C. A. Potts of the Ministry of Defence Library. 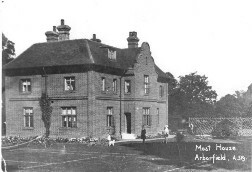 Mr. M. F. Shearn, Clerk to the Arborfield and Newland Parish Council, kindly allowed photographs from his archives to be reproduced and also sought out reminiscences from his acquaintances who remember the Remount Depot; in particular, Miss V. Gutteridge and Mr. G. Bentley who provided most interesting material'. Arborfield and the Army Remount Service, 1904-1937 - Colonel R. Hume, B. Sc. (Eng. ), C.(Eng), M.I.E.E.